Wedding dress, check. Guest list, check. Wedding venue, hmmm… don’t worry, folks, we’ve got you covered! 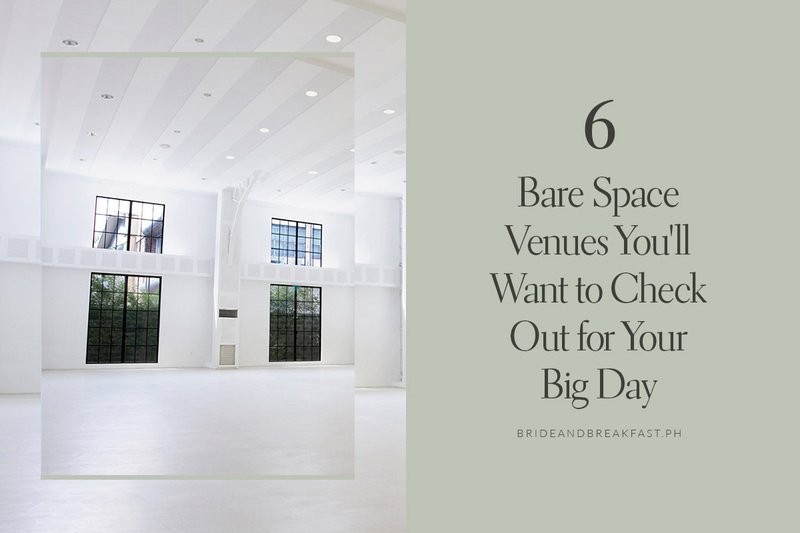 If you’re looking for a specific type of events venue, like a bare space that will allow you to translate all your dream wedding ideas and concepts, then you’ll certainly want to check out the list of bare space venues we rounded up for you today! “A modern-Asian classic nestled within the capital of business.”–The Blue Leaf Events Pavilion couldn’t get this description any more on-point. Located at McKinley Hill Village in Taguig City, this events place is one of the three venues of The Blue Leaf Events Space. It not only has a convenient and accessible location, it’s got sophisticated designs and it also has several options to choose from. The photo above is the largest and one of their three functional halls: Banyan, which seats 300 people. If you’re having less guests, they have two other halls that may suit your guest list better: Silk, which seats 250 and Jade, which seats 200. The Blue Leaf Events Space also has venues in ASEANA City called The Blue Leaf Filipinas and in Quezon City, The Blue Leaf Cosmopolitan, so you might want to check those out too! Yup, Enderun is more than just a culinary center, it’s got several event venues too. With its red brick walls, high glass ceilings, and huge windows, The Atrium gives off an airy and classy outdoor Parisian vibe, and is actually just one of the three event space options of Enderun. Go check out The Tent at Enderun Colleges and The Courtyard too, and see which event space suits you and your wedding’s style best! If you want a big, bright, open indoor space tucked away in the hills of Cavite for your wedding, then The Hills at Silang might just be the venue for you. What’s special about this place, besides being so close to nature, is that it has rooms for you and all your wedding guests to stay in. With accommodations like this, you won’t have to worry about rushing to the venue on the big day. Everybody loves an accessible wedding location, right? Now you’ll be glad to know that One Canvas is located in the heart of Makati, and has such a spacious and modern space. With its classy industrial-esque ambience and large, bare space, it’s sure to be the perfect blank canvas to make your dream wedding concepts and ideas come to life. For a vintage, timeless, and elegant feel for your wedding, you might want to check out Villa Milagros. With historical architecture and spacious gardens, you’ll have two equally good options of either holding your wedding indoor or outdoor. To top this all off, if you book this place, you’ll be able to use their stunning venue for your engagement shoot for free. An all-white space with high ceilings and floor-to-ceiling windows is what Whitespace Manila has in store for your wedding. The great thing about their function halls is that they’re so basic yet modern, so whether you want to dress it up or dress it down, it will look good both ways. Also, you and your event stylist will have all the freedom to transform the space into your liking. The photo above is their “Gold” room, their second largest hall, which seats 300. Their largest hall, “Platinum”, can seat 450 guests and their “Silver” hall seats 150. They also have a Lobby that can accommodate 60 guests–this would be perfect if you prefer a more intimate setup. « We Found an Accessible All-in-One Wedding Venue Just Outside the City!